Jan and I did not have eggs for breakfast today, so I thought I would make deviled eggs for lunch. Jan is constantly worried about her cholesterol, so she keeps a strict limit on the number of egg she eats. Plain soft boiled eggs are the rule at this house, but I like to spice things up occasionally. Note: This recipe is for two people, but it is easy to scale up the ingredients to as many as you have diners. Figure 1-2 eggs per person. Deviled eggs are one of those dishes that you could make differently every time you make it. At its simplest, it is just the hard boiled yoke mixed with “something(s)” and returned to the hole in the white. What you mix with the yolk is limited only by your imagination. I had bought some Cornichons—which I had forgotten to put out for the dinner that I had planned to use them. 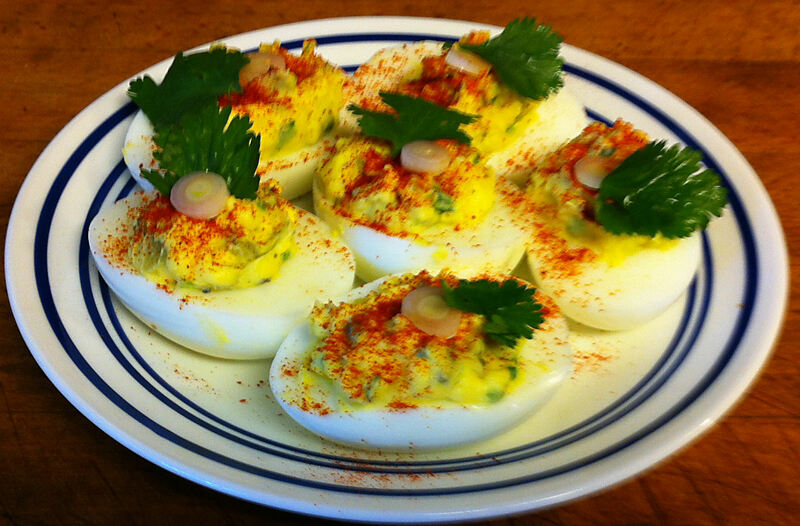 Eilene opened the jar yesterday, so they seemed like the pickle to use in these deviled eggs. French pickles call for Southern French/Spanish paprika, Pimenton. Note: I use Kraft fat-free mayonnaise—the best tasting faux mao—because of Jan’s dietary restrictions. Feel free to go full fat. 1. Steam the eggs for 12 minutes. Tip: I do not “boil” my eggs any more. A few issues ago, Cook’s Illustrated had an article about how to make the perfect boiled eggs. The author had discovered that there was no way to “boil” an egg with any predictability, it would always come out either over or under cooked. The solution was to take the eggs out of the water. Put a bit of water in a pan and lay a wire screen on the bottom—I use a perforated round tray from my rice steamer—this keeps the eggs out of the water. By steaming the eggs for ten minutes the whites are firm and the yoke is perfectly yellow, with no dark discoloration on the outer surface of the yoke. 2, Slice the green onion finely. Reserve six slices of the white part as garnish. 3. Peel the eggs under running water and slice them in half on the long axis. 4. “Pop” the yokes into a bowl and mash them thoroughly with a fork. Tip: Press the back of the egg with your thumb and the yolk will just fall into the bowl. Note: You do not want any dry lumps of yoke in your filling. By mashing the yokes dry it is easy to tell when you have broken up all of the lumps. 5. Add the mayonnaise, Cornichons pickle, green onion, pepper, and salt to the bowl and mix well. 6. Spoon the filling into the holes left by the yokes. Tip: Some cooks “pipe” the filling in into the holes (put the filling in a plastic bag and squeeze it through a hole cut in one corner). While this may make for a more decorative egg, it just seems way too fussy for me. 7. Sprinkle a bit of Pimenton on each egg. 8. Garnish the eggs with the cilantro leaves and white green onions slices.